My Warrick Ice Cream Trike is a delightful old tool, well weathered rather than restored – which is exactly how I like my vintage vehicles. I never did discover why it has this particular colour scheme, as most ice cream trikes that Warricks made for Walls were blue, with their lettering as shown in the picture below. Nevertheless, it does appear to be its original paint scheme, which makes it somewhat rarer than usual. It’s a bit bumpy to ride with its original cushion tyres …a 1920s euphamism for solid tyres! Above the rear mudguard is the tell-tale Warrick triangular sign. This was adopted by the company because their tricycles were provided to businesses on a kind of lease hire, with Warricks responsible for maintaining the fleet. But chaps often used to hitch a ride on the back of the delivery bikes and trikes, sitting on the rear mudguard, and that would have obviously caused excessive wear and necesitated more repairs than usual. The triangular sign – which bore the Warrick logo – made it much more difficult to carry a passenger on the rear mudguard. Because they provided their own maintenance schemes, Warrick’s tricycles were well-made. As you’ll observe in the picture below, the coolbox is accessed from the top of the box. The entire top of the wooden ice cream box can be removed. So it would not be difficult to set up this ice cream trike with a modern coldbox inside its original wooden box. The box has a wooden frame and floor but the sides are metal. The paint is weathered. Antique dealers would describe it as patina. But the box itself is remarkably sound, as you can see in these photos. A fellow enthusiast emailed me as he has a similar box-trike. Unfortunately his is missing its braking mechanism and he needed photos so he could make one. So just in case anyone else needs to see how the brake works, here are close-up pictures to help. You’ll also observe the frame number of this Warrick, which begins with a letter ‘W’ (in case you have a box-trike and wish to know if it’s a Warrick). 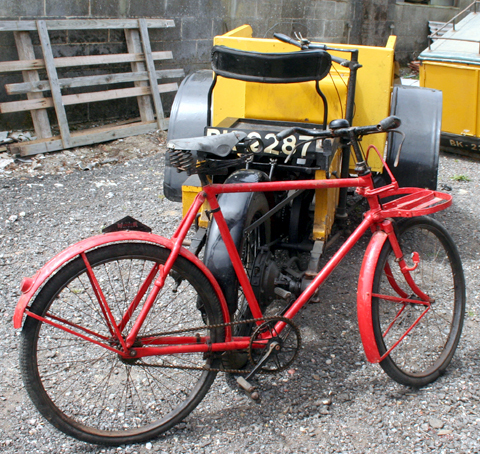 On the John Warrick Museum website, there’s a page comparing this 1920s Warrick with a ‘modern’ 1950s Pashley delivery trike (Pashley were one of Warrick’s main competitors).